This spring, the PSE will host an interdisciplinary group of scholars to talk about their work in our Workshop for Society and the Environment. The topics range from climate journalism, socio-ecological resilience, carbon removal, studying socio-environmental networks, and digital aesthetic experiences. As usual, the Workshop will take place on Wednesdays at 10:30 in ASY 1101. Check out the full schedule here and I hope to see you there! Congratulations to our new doctors! The Program for Society and the Environment is delighted to announce that two of our Fellows (and members of the Climate Constituencies Project research team) have successfully defended their PhDs! Dr. Anya Galli Robertson defended her dissertation, "Disproportionality, Discourse, and the Debate Over Coal-Fired Power." Anya has accepted an offer to be an Assistant Professor in the Department of Sociology, Anthropology, and Social Work at the University of Dayton and will be moving there this summer. Dr. William Yagatich defended his dissertation, "The Sociological Study of Expert Knowledge Work: Current Trends and Changes in the Study of Professions, Professionalization, and Professionalism." Bill has accepted an offer to be a Postdoctorate Research Fellow at George Mason University's Center for Climate Change Communication and is starting immediately. Good luck Anya and Bill! I wanted to post this summary of what is to come at the Program for Society and the Environment in 2018. We are resuming the Workshop in Society and the Environment and have a great interdisciplinary list of speakers scheduled. I hope to see everyone at our first Workshop later this month! CLIMATE CONSTITUENCIES PROJECT UPDATE: It's still not the science folks! ​ In the past few months, there has been a lot of talk about the science of climate change, with challenges coming from inside the Trump Administration. In fact, the EPA Administrator has made his intentions to review the science very clear. As a result, it is unclear how an administrative push to challenge the science is related to the perspective of the US climate policy network (or the policy actors who make the decisions about energy and climate policy in the United States). As part of our Post-Election wave of the Climate Constituencies Project, we once again surveyed the top policy actors involved in climate and energy issues at the federal level and in four swing states: Florida, Nevada, North Carolina, and Ohio. In each, the ‘top policy actors’ were identified using a methodology adapted from our previous work, which has been published in Nature Climate Change, and Contexts. This post-election survey began after the Trump Administration's first 100 days and closed at the end of June. As part of it, we once again asked the top policy actors their attitudes about the science of climate change. Responses were scored on a scale of 1-5 ranging from strongly disagree to strongly agree, mean scores from the pre-election wave in 2016 and the post-election wave in 2017 are reported in the table above. 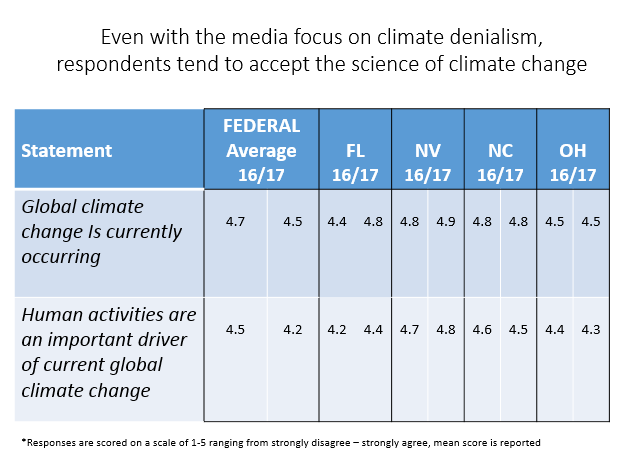 The results show that, although federal attitudes have gone down slightly, there continues to be an overwhelming level of consensus around the science of climate change among policy actors at the Federal level and in these four swing states. As with our pre-election wave, there are no statistically significant differences in opinions on these questions across the four states and at the federal level. ​Dr. Paul Stern is a senior scholar at the National Research Council of the National Academy of Sciences. Dr. Stern presented a recent research project titled “How can social science become more influential in energy transitions?” on April 5th. This work explores how social science can influence energy outcomes through social science energy research, or “SSER”. Dr. Stern distinguishes “pure” SSER from “applied” research that directly seeks to influence policy and energy outcomes. Highlighting public perceptions of technology and social consequences of energy policies are just some of the ways that social science can help to speak to energy research. This work is even more important in the current political climate, as the role of science in policy making is uncertain. Dr. Stern argues that social scientists need to identify influential research topics with the potential to significantly affect energy use, while also focusing on problems that allow them to add explanatory value beyond what other disciplines can offer. Dr. Stern discussed the ways that social science has tended to focus on energy issues or behaviors that have limited potential for positive change in energy terms. Specifically seeking targets that have this greater potential can allow social science to have increased real-world influence. This presentation helps us to consider the ways that social science could directly impact energy use and transition beyond “pure” research that reaches limited audiences. Through projects analyzing such topics as household behaviors, social aspects of emerging technologies, and behavioral components of organizational energy use, social science can inform a changing energy landscape. Following the April 22nd March for Science, this project contributes to an emerging discussion about the role of science in policy and social change. Although the Trump Administration is telling a different story, coal won’t be making a full comeback. ​In this context, the discourse of “bringing back coal jobs” is more political than it is practical. ​I’d love to write something about how science will fare in the Trump administration. I’d love to look forward to some semblance of equilibrium between the far-right ideology that got Trump elected and the mandate for innovation and progress in the sciences. I’d love to simply be able to say that science will survive the Trump administration. But so far there’s no science to speak of in the administration at all. There are 46 science and technology positions for which the President must send nominations to the Senate for confirmation. These range from commissioner of the Nuclear Regulatory Commission to the director of the Census Bureau, comprising many scientific different disciplines and levels of bureaucracy. All of these positions are meant to advise the administration — sometimes the President directly, as in the case of the empty chair of the Council on Environmental Quality — on the most important science-related issues facing the nation and the world today. Government civilian science will not receive much support from the White House in the next four years, and this lack of support won’t be a central story in the media. What does that mean for the future of federal civilian science? A week before the 2016 general election, I posted a piece on the then-upcoming referendum on Amendment 1 in the Sunshine State. The amendment failed to pass, but solar’s future in Florida remains uncertain. The governor and the Republican-led legislature are not eager backers of renewable energy, and the powerful investor-owned utilities (IOUs) will now turn their attention to lobbying the legislature and Public Service Commission on policies that will keep them in the driver’s seat. Amendment 1 received 51% of the vote on November 8th, falling well short of the 60% required to pass constitutional amendments in the state. The vote, however, has not triggered any substantive changes in the way that solar is generated and distributed. Net-metering laws in the state still prohibit individuals and businesses who generate solar power from selling excess to directly to neighbors; they are required to sell back to the utilities. While Consumers for Smart Solar failed to encode this arrangement into the state constitution via Amendment 1, those net-metering statutes are still on the books. It is unclear when this status quo might be upended. As I discussed in my previous post, the Floridians for Solar Choice coalition attempted to get a competing amendment on the 2016 ballot that would have opened up third-party solar sales in the state. While they failed to garner enough signatures to put the amendment before voters, they have vowed to try again on the 2018 ballot, and the defeat of Amendment 1 has boosted their morale and optimism. It may seem strange that a constitutional amendment is the preferred method of overturning statute on something like solar energy, but such is politics in Florida. Attempts to get the Republican-led legislature and Governor Scott—who benefited from millions of dollars in campaign contributions from the IOUs—to change the statute via conventional means is a non-starter. If anything, the IOUs may try to use their influence to pressure the legislature and the Public Service Commission to weaken existing net-metering laws and to cripple tax abatements for solar. If they are successful in doing so, then even if Floridians for Solar Choice’s amendment makes the ballot and passes, many of the incentives for residents and businesses to invest in solar may be gone by 2018. In addition to those possible roadblocks to an open and competitive solar market that the IOUs may set down before a 2018 referendum, solar advocates must contend with the reality that the Clean Power Plan is as good as dead in states like Florida where the governor and attorney general oppose it; Donald Trump’s assumption of power has all but guaranteed that. As a result, the urgency of investments in renewable energy has dissipated. Even if a Democrat wins the governorship in 2018—and that’s a big “if”—the near-inevitable continued dominance of conservatives in Tallahassee means there is little chance of renewable portfolio standards being passed. So, while pro-solar forces were heartened by Amendment 1’s defeat, the battle is far from over. Preventing the IOUs from enshrining their monopoly in the state constitution was a necessary but insufficient step in expanding solar’s reach in Florida. Now, Floridians for Solar Choice and its allies must turn their attention to fighting the IOUs in the legislature and Public Service Commission, guarding against attempts to decrease net-metering compensation or dilute tax credits for renewables. Moreover, to lay the groundwork for more progress down the road, environmentalists must gear up now to elect pro-clean energy candidates from both parties to the state legislature and Florida’s congressional delegation in 2018. The degree to which the coalition has the political will, organization, and resources to accomplish even some of this agenda remains to be seen. Dr. Dana R Fisher : "the Women's march was only the beginning"
Dr. Dana R Fisher, PSE Director and Professor of Sociology at the University of Maryland College Park, recently wrote on the Contexts blog about the Women's March and its significance, both within today's political climate and within the social movements literature on repertoires of contention. "The strength of America’s democracy lies in the opportunities for individuals to be heard and the ways that they express their voices through the manifold tactics available to them." ﻿THE SOCIETY AND ENVIRONMENT SERIES AT COLUMBIA UNIVERSITY PRESS IS OPEN FOR SUBMISSIONS! The impact of humans on the natural environment is one of the most pressing issues of the Twenty-First Century. Key topics of concern include mounting natural resource pressures, accelerating environmental degradation, and the rising frequency and intensity of disasters. Governmental and non-governmental actors have responded to these challenges through increasing environmental action and advocacy, expanding the scope of environmental policy and governance, and encouraging the development of the so-called “green economy.” This book series encompasses a range of social science research, aiming to unify perspectives and advance scholarship. Books in the series focus on cutting-edge global issues at the nexus of society and the environment. The series is being edited by Dana R. Fisher (University of Maryland), Lori Peek (University of Colorado), and Evan Schofer (UC-Irvine).